Two familiar faces grace the cover of the November issue of Entertainment Weekly, though there are key changes to their appearances that will likely have Game of Thrones fans freaking out. Emilia Clarke and Kit Harington, in full Daenerys Targaryen and Jon Snow costumes, are EW's new cover stars, and we've got so many questions about what's to come in the eighth and final season of this epic fantasy show. As reported by People, Clarke and Harington's snowy embrace is the first official photo from the new season of Game of Thrones, which is already telling. They're sporting fur coats and gloves, likely to fend off the winter chill, but they also have their hair pulled back — perhaps so they're ready for battle? Daenerys' hairstyle is brand new, and Jon has a cut on his face that looks fresh, though there's no blood to be seen. Are they fighting for Westeros together? Have they realized they're related yet? Do they really have to be this photogenic even in the middle of winter, which has finally come? It'll be a while before we learn the answers to any of those questions, so buckle in for the ride. 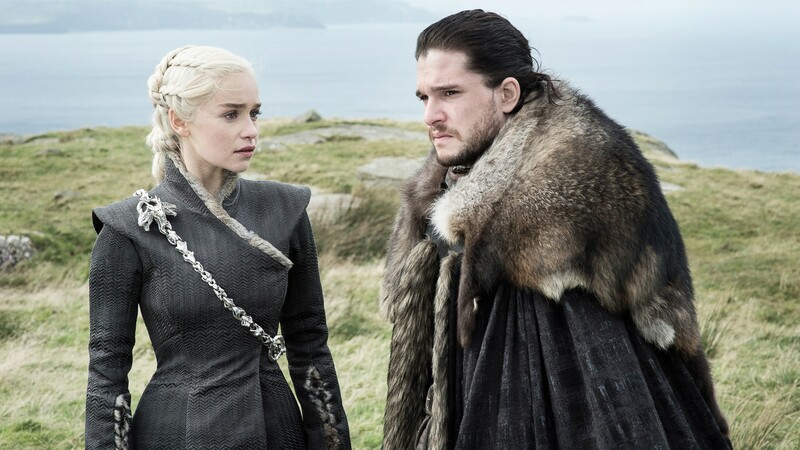 The final six episodes of Game of Thrones were shot over 10 grueling months, according to People, because the cast and crew were so invested in getting the final hours right for die-hard fans. Since the final season will reveal these characters' fates, which haven't even been published yet in George R.R. Martin's A Song of Ice and Fire book series, it's a pretty big deal. All this build-up is killing us, especially with this brand-new photo in the mix. Previously, Sophie Turner hinted that fans will likely be divided by how Game of Thrones ends, and Peter Dinklage was just vague enough about the fate of his character, Tyrion, to make us shake in our proverbial boots. Meanwhile, we also learned about an important returning character and started stocking up on tissues, because we know we're going to need them.